With their ease of growth and colorful displays, Irises are ideal perennials for most gardeners. In the late spring to early summer they produce stately, showy blooms in a wide array of colorations and textures. Nearly every color of the rainbow is represented and the petals of the various cultivars range from plush velvet to the finest silk textures and satisfy a wide range of tastes. In additional to their flowering attributes, bearded Irises are easy to establish and require a minimum amount of maintenance. Irises are most commonly described by their flower parts. The three petals that go upward are called 'Standards'. The three that hang down are referred to as 'Falls'. The fuzzy looking or hair-like parts on each of the 'Falls' is the 'Beard' (The common name, bearded Iris is referring to these flower parts). Each part of the flower can be the same or a different coloration. When all of the flower parts are the same color, it is called a 'Self'. Bearded Irises grow from thick, fleshy underground stems called rhizomes. The semi-evergreen leaves are stiff and strap-like (sword-shaped) and grow in fan-shaped clumps. Once established, they are very drought tolerant and work well in areas that receive only a limited amount of summer rainfall. The genus name Iris comes from the Greek goddess Iris. Iris is said to have walked between heaven and earth over a bridge made by a rainbow. Whenever she walked on earth, her footprints bore flowers with as many colors as the rainbow. German irises are available in a wide range of plant heights and are often classified by their plant size: Miniature Dwarf (up to 8 inches) Standard Dwarf (8 to 15 inches) Miniature Tall (16 to 25 inches) Intermediate (16 to 27 inches) Tall (28+ inches) Generally, the shorter Iris cultivars flower first, followed by the intermediate types and then the taller Irises bloom last. Iris prefers to be planted in locations with a light, loamy, well-drained soil. Planting them in locations with poor drainage or in tight clay soils may keep the rhizomes too wet and often leads to poor plant performance and possibly plant mortality. 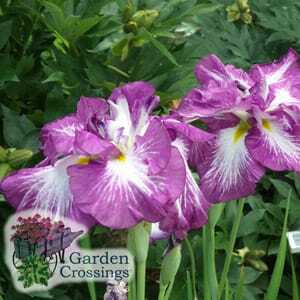 Bearded Iris grows best in full sun, but will also perform well under partial shade. Excessive shade will reduce or prevent flowering. Containerized Iris can be planted throughout the growing season, but are most commonly planted in the spring. They should be planted high enough so the top of the rhizome is slightly above the soil level. They are generally considered easy to grow and require little routine maintenance. To encourage a nice flush of blooms, keep the soil moist, but not wet, just prior to flowering. To encourage reblooming types to re-flower in the late summer, they should be watered as needed throughout the growing season. To prevent seed formation and maintain vigorous growth, cut the flower stalks back after the flowers fade to an inch or two above the rhizome. In the fall, cut the leaves back to 6-8 inches above the ground and destroy them to prevent future insect and disease problems. They usually do not require the application of fertilizers. If fertilizers are applied, avoid placing them directly on the clumps as this can burn and injure the rhizomes. The use of mulches is also not recommended. After 3 to 5 years, once the clumps become crowed, it may be beneficial to divide them. They can be divided at any time, but most commonly gardeners divide them 4 to 6 weeks after flowering. Cut the leaves to one-third their length. Dig up the clump and wash the soil off the roots and rhizomes. Cut the rhizomes apart so each section has at least one healthy fan of leaves, a firm rhizome, and white roots. Aphids, Bacterial soft rot, crown rot, fungal leaf spots, and Iris borer may occasionally become problematic. These problems can often become serious. With bacterial and crown rots, remove and destroy any infected plant parts to avoid the spread of these diseases to healthy plants nearby. Avoid using excess fertilizer and fresh manure and provide as much drainage as possible. To reduce the occurrence of leaf spots and borers, remove and destroy any old leaves, stems, and plant debris each fall. Iris is most commonly used as specimen plants or in mass plantings. Bearded Iris can be grown in containers for indoor or outdoor uses. The flowers are commonly used as dried flowers or in cut flower arrangements. These tough plants are also resistant to various critters including deer and rabbits. German Iris blend well with other sun loving perennials including Agastache, Armeria, Delosperma, Dianthus, Echinacea, Euphorbia, Geranium, Hemerocallis, Lavandula, Leucanthemum, Penstemon, Peony, Phlox, Salvia and Sedum. For information about caring for your perennials once they arrive and other general perennial information, see our Perennial Care Section.